The new LED luminaires from LEDVANCE for industrial use announced at Light + Building will be available at electrical wholesalers for the new lighting season. 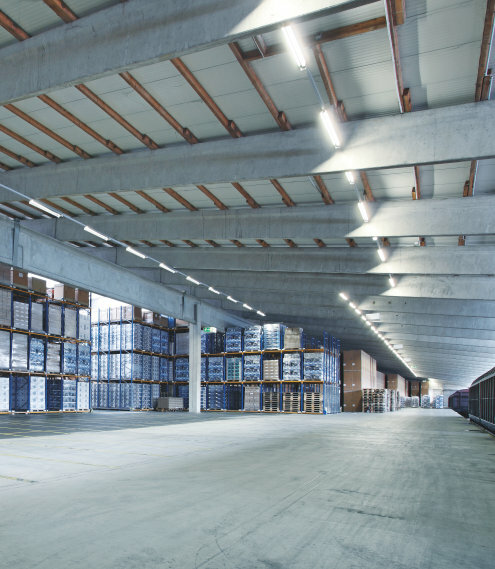 With its high-end products for special user requirements, LEDVANCE offers a wide spectrum of lighting solutions for factories, workshops and warehouses. LEDVANCE is adding smart High Bay DALI luminaires to its product family of powerful high-bay luminaires for warehouses, factories and logistics centers. They can be extended with external presence and daylight sensors in a DALI environment – for daylight and occupancy-dependent operation. 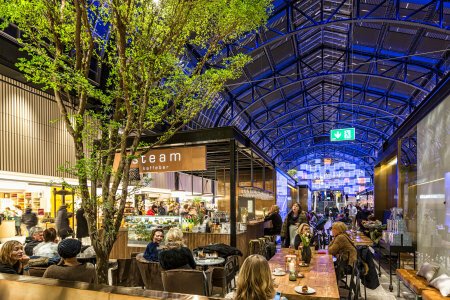 This results in even greater energy savings than the new LED luminaires already achieve with their high luminous efficacy of 140 lumen per watt. New at wholesalers is also the High Bay DALI CLO which achieves constant luminous flux throughout its entire life. This makes calculations and planning easier for users as they can rely on the products keeping the same brightness levels throughout their L100 life span of up to 50,000 hours. In factories with many open milling machines, in the food industry, and in commercial kitchens damp-proof luminaires are needed which can withstand residues of oil, gases and also cleaning detergents in the air. Offering IP69K protection, the new Damp Proof Special luminaires from LEDVANCE are so robust that they can even be cleaned with a high pressure washer – thanks to high-quality PMMA plastic in combination with stainless steel caps. The visually attractive linear luminaires are extremely energy efficient at 150 lumen per watt. Installation is very simple because the LED luminaires are through-wired at the factory. Mechanical installation is tool-free using simple terminals. 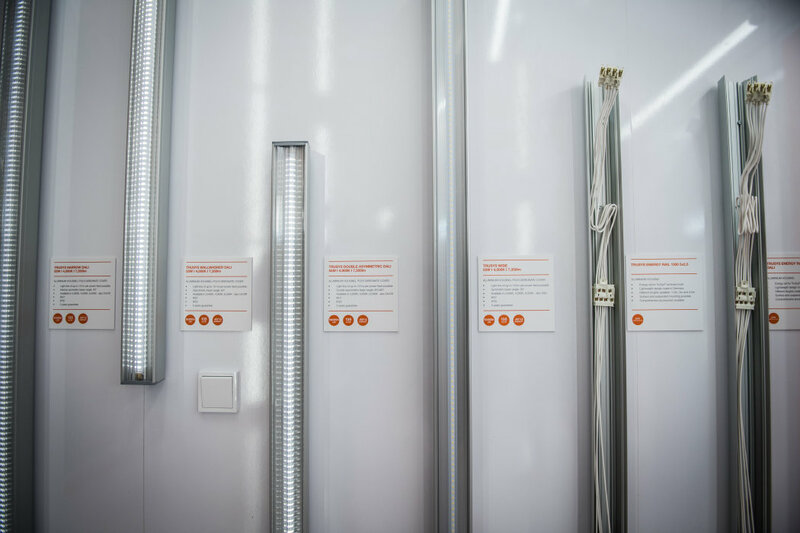 Consisting of mounting rails and flat linear lighting inserts, the new flexible trunking system TruSys offers homogeneous and energy-saving lighting for large areas. In a minimum of time, the lighting inserts can be simply clicked into place either as a continuous or intermittent lighting strip and then be mounted on the ceiling or be suspended. With a luminous efficacy of 135 lumen per watt, they are very energy-efficient. The exclusive “Scale” luminaire design is also used for the TruSys family with its high-quality and lightweight anodized aluminum housing. The TruSys luminaires can be mounted on the ceiling or can be suspended. 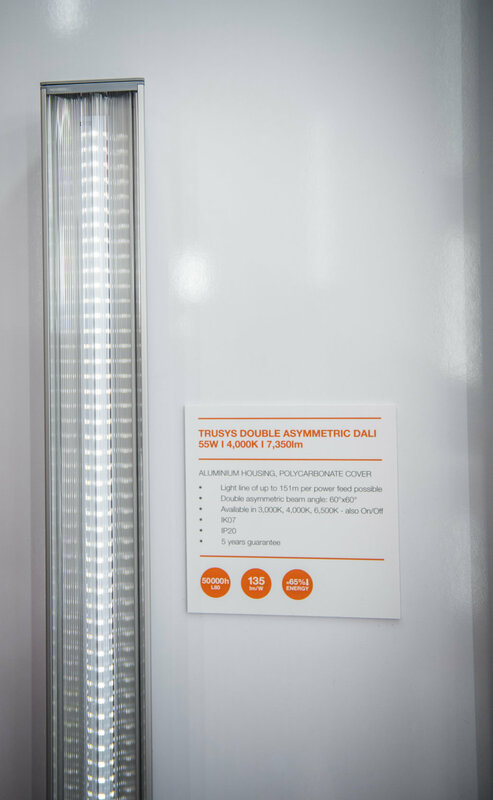 The mounting brackets are recessed in the rails and therefore almost invisible from the outside which adds to TruSys’ clean appearance. Of the four available lenses, two in particular are relevant for the industrial sector: the wide-beam lens for uniform illumination in rooms with low ceilings – for example in workshops and factories – and the narrow-beam lens for high ceilings which is needed in high-bay warehouses. TruSys is also ideal for shop lighting. The LED luminaires for lighting professionals will be marketed under the LEDVANCE brand and be listed in the Relux and Dialux planning software by the time of the market launch for the new lighting season.